If you are a certified Salesforce professional you probably received an exciting email from Salesforce around December 10th 2013 inviting you to participate in a new online certification verification program. To complete the process you simply had to login to your Webassessor account. As soon as you did you were given the ability to opt in to the program. If you missed the email you can read more about the opt-in process in this related article from Salesforce. Online verification of someone’s technical certification is not a new concept. Many large IT companies that have certification programs allow employers or other agencies to verify certification credentials on individuals or potential new hires to ensure a candidate’s credentials are valid and up to date. Companies like Microsoft and Cisco have had websites for this purpose for years. The fact that Salesforce has taken this step says a lot about the strength and importance of Salesforce certification program – a program that has only been around since 2008 (a relatively short five years)! Online certification verification went live on December 17th, 2013. 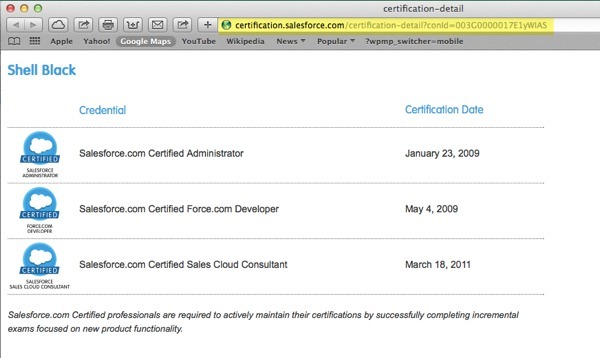 You can check to see if someone has a current Salesforce certification by going to http://certification.salesforce.com and clicking on the verification button. TIP: If you want to save a potential employer time, you can email them a link to your certification by opening the pop-up window in a new tab and grabbing the URL. That way they can navigate straight to your credentials without having to search! 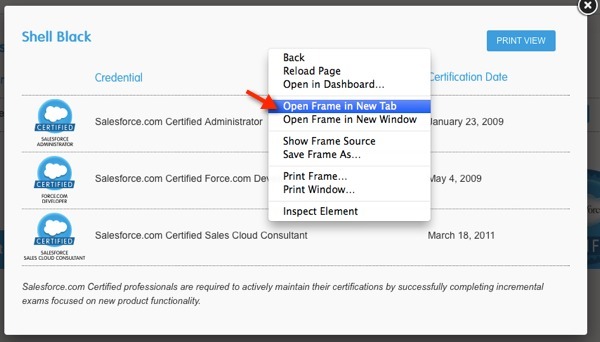 Here is an example URL to navigate straight to your online Salesforce certification page.